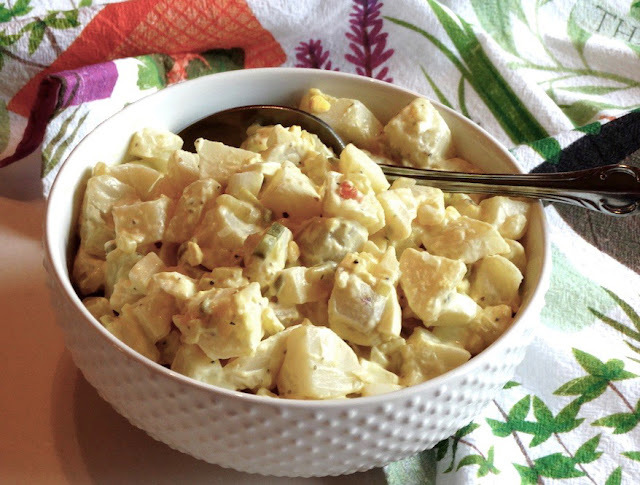 Pam's Midwest Kitchen Korner: Trisha's Potato Salad - Simply the Best! I'm sure this is the first time I've never added onions to potato salad. And I always added sliced olives, or pickles, celery or celery seed and usually Miracle Whip, instead of mayonnaise; added a dab of mustard, but no eggs. Then there was always the sprinkling of paprika. I was amazed how delicious this potato salad was without all the extras. 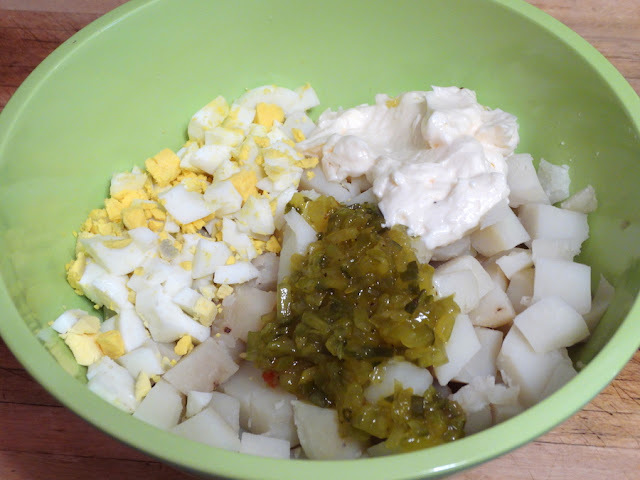 This is easy peasy delicious potato salad with just a few ingredients: potatoes, eggs, mayonnaise, sweet pickle relish and salt and pepper. Waxy ~ look for red, new, or fingerling potatoes. These potatoes are thin-skinned, with a creamy texture and less starch, retaining their shape well when boiled; this trait makes them perfect for potato salad. In-Between ~ look for white and Yukon Golds. They're all-purpose potatoes containing more starch than waxy, and are generally good in most potato dishes, including potato salad. Starchy ~ look for Russets. These are thick-skinned potatoes that are more granular, making them fall apart while being cooked. They make a perfect baked potato, mashed potatoes and roasted potatoes, but this is not the potato you want for potato salad! I always use red potatoes for potato salad and so did Trisha in this recipe. Yukons are probably fine, but I don't favor yellow potatoes. Thus, always purchase waxy potatoes for potato salad and aim for potatoes of an equal small size to boil them whole - they will then all cook evenly in the same amount of time. Potato salad is personal, add what you like, but I guarantee this simple recipe will be hard to beat, it truly makes simply delicious potato salad! Bill said this potato salad tasted just like his Mom's potato salad. It was a big hit for him, and me too! Try it, you'll like it, I bet! If you want to make potato salad just like your mom used to, here's the recipe. It's Trisha Yearwood's ~ it's simple, easy and delicious! Place potatoes in medium saucepan. Add salt and enough water to cover the potatoes, boil until tender when pierced with the point of a knife but hold their shape (do not overcook), about 30 minutes. Drain the potatoes, transfer to a large mixing bowl, cool completely; peel and cut into ½" cubes. Add hard-boiled eggs, mayonnaise and relish, fold to combine. Yep, it's all about personal taste, Larry! Thanks for the visit! Nice and simple, this looks like a wonderful potato salad. Although I might be tempted to add a bit of onion. :-) Good stuff -- thanks. I am totally with you, Pam. Very often simplicity is the best! Your potato salad looks very delicious. Love potato salad Pam, these looks delicious ! Thanks by thius recipe! Looks like a potato salad my mom would make! Simple, classic and delicious! Just what Bill said, Liz. Simple for sure! That's a traditional potato salad. I like the red potatoes (we import them from Turkey). I often make this salad (no mayonnaise, with onion). The eggs and pickles (protein and fermented stuff) are good for our health. It is traditional, for sure, Duta. I like red potatoes also and good it has some healthy ingredients. Have a wonderful rest of the week! I know what you mean, David. Have a great rest of the week/end! Easy always works so well, Pam! I like relish as an ingredient, here. Thanks for stopping in to my blog. The past few months I've been working on genealogy for the Longmeadow Historical Society and not blogged as much. Hi Judi! Sounds like you've been busy! Have a great summer! I love potato salad not all but a lot. This sounds so yummy, will have to try it. Easy is what I like. Easy is good! Have a great weekend, Melinda! I love potato salad! Both as a side or alone. I love potato salad will try this out, thanks. Have a good weekend Diane. Thanks, Diane! It's easy to make and good. You have a good weekend too! Potato salad is one of my favorites. Love this simple version! yum!! I love Trisha's cooking! Me too, Leslie! She has some great recipes! I love potato salad and would enjoy this one...my mother always put eggs in hers. I wonder how much potato salad will be consumed over this Memorial Day weekend. Lots I'm sure.